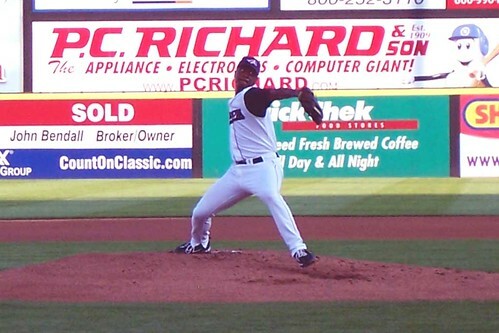 The Somerset Patriots (and the whole rest of the Atlantic League) started the second half of the season last night. Unfortunately for Patriots fans, the team found yet another way to disappoint. But I don’t want to talk about that. 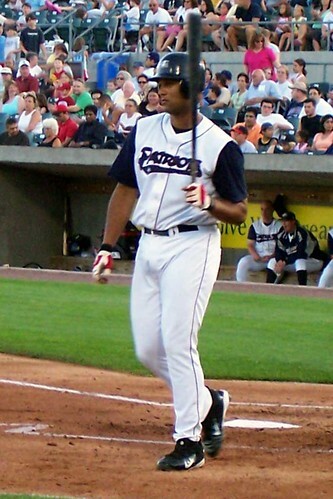 I’d rather talk about Edgardo Alfonzo, the one-time New York Mets All-Star and current Bridgeport Bluefish second baseman. Getting to see him play again was the main reason I was excited to go to last night’s game. Evidently I wasn’t the only one interested in Alfonzo’s return to the Tri-State area… News 12 sent out a crew to interview him before the game. After he finished the interview, Alfonzo signed my friend’s ticket stub and my baseball, so I was happy. His performance in the game wasn’t particularly memorable… 0-for-2 with a couple of walks. One of his outs was an RBI infield groundout, though. No particularly memorable fielding plays, except for an easy ground ball that he fielded and threw into the Patriots’ dugout. Still. I hope that he’s able to play well enough to convince somebody to give him one more shot in the majors. 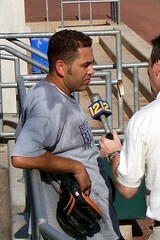 He remains one of my favorite New York Mets and is still nice to his fans. Robert Averette threw 110 pitches over 5 2/3 innings en route to a no-decision in his second start for the Patriots.